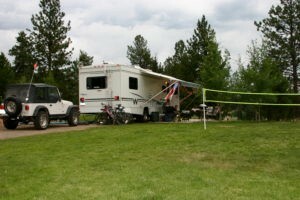 Let me tell you about this little gem of a campground tucked in the beautiful Idaho pines: McCall. It is hands-down one of my favorite places to visit and definitely my favorite place to camp. 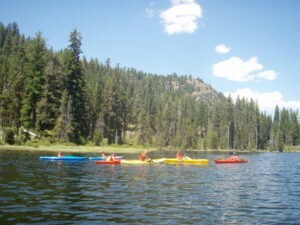 McCall is a quaint lakeside town on the banks of Payette Lake located 100 miles north of Boise. It’s a scenic drive up Route 55 that borders the Payette River. Mining led to the boom of the area in the mid-late 1800s and many of the towns along the way still have that “old days” charm. We found out about this piece of paradise from someone Mark did business with and visited the first time in the winter of 2004. We rented a cabin in town for a long weekend to ski with our boys and my aunt and uncle at Brundage Mountain Resort. It was the perfect sized mountain for us to get back into skiing. Mark and I had taken time off from the sport when our kids were born and this trip was their first time skiing. We lucked out and were there just after their annual Winter Carnival. Part of the carnival is a snow carving contest. I’m not talking a little block of snow carved into a pumpkin. No, this is a huge amount of snow and the carvings are elaborate and intricate. 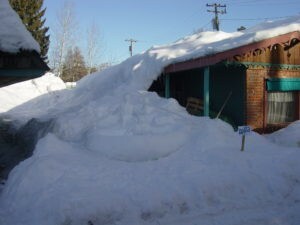 One of my favorites was done at a house with the snow that had fallen from the roof. It was carved into a whitewater raft going through the rapids complete with a full boat of adventurers. 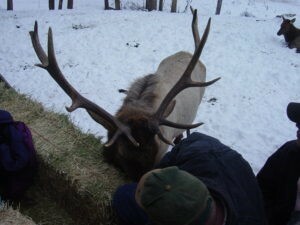 While there, we also booked a sleigh ride in an elk preserve in the nearby town of Cascade. It was more like a sleigh stop than a sleigh ride, though. The tractor pulled us into the giant preserve and stopped. The elk quickly came over and started munching on the hay bales we were sitting on. We had a great time watching the hierarchy of the herd and dodging their huge antlers. Our next trip to McCall was in the summer of 2006 as we traveled toward home from Banff. McCall is majestic in the winter and even more beautiful in the summer. The lake is a deep blue with pine trees down to the water. Our lodging for a couple of days that first visit was at the McCall RV Resort. Little did I know that on that first drive down the little hill to check in that I would fall in love with the entire place. 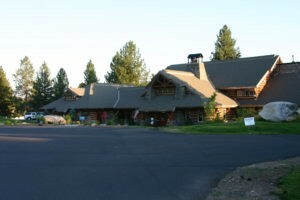 The lodge is huge with room to hold an event while you stay there and an extra-large back patio complete with patio tables and umbrellas. The sites are spacious with lots and lots of grass — blade grass that feels good under your feet. The summer grass in Phoenix is… how do I put this? Awful! One thing I miss from growing up in California is the grass. Weird, I know, but it’s true. There is no laying on the grass and looking at the clouds in the summer in Arizona even on a rare cool day. 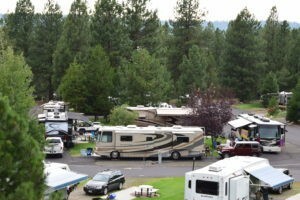 The campground is on the banks of the Payette River. A space close to the river wasn’t available and we were given space #49, an end space right across from the pool. The grass area was big enough for us to set up our badminton net and play a few games during our stay. The river didn’t have any fish (at least not any that we caught). Grass bass was the catch of the day from our poles. The pool is inside with glass garage doors for winter use. I remember the entire campground as being immaculate. Mark chatted up the friendly staff as we checked in. The couple he talked to were there for the summer. They worked 30 hours a week between them, which got them free lodging. The rest of their time was spent exploring the area. Mark told them we’d been to McCall before in the winter and what we had done. The husband told us about nearby good rafting nearby, the bike trail, and the must-see downtown district. We hopped on our bikes and rode the bike trail down to the downtown area. The main street is just so cute. Hanging plants are on every street light, and stores have their doors open wide with merchandise ready to be bought. There was even a lakeside city park we’d missed completely when it was covered with snow during our winter visit! Mark wanted to check out the boats on the lake, so we rode over to the marina aptly named the Mile High Marina because McCall’s elevation is just that — a mile high. It was a shame no boats were available to rent for the afternoon; that would have been a fun ride around the lake. 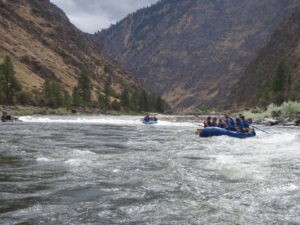 We did, however, have time for a white-water rafting ride in nearby Riggins, ID. If you haven’t rafted, you are missing out. You get to see the beauty of the area from a completely different vantage point. Too soon, we were headed home. Our stay was too short, and we vowed to be back. McCall is one of those places that stays with you. We couldn’t wait to get back to this place and this campground. 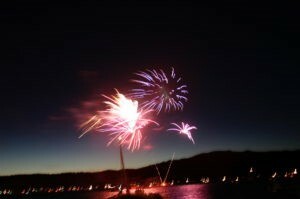 We were back the very next summer for a week including Independence Day. Mark’s mom and stepdad joined us along with his brother and family and our dear friends Bill and Deb with their younger children. We scored a pod campsite; this is the best for a group. Four spaces open up to the same large grass square. We put up our badminton net and still had lots of space for the kids to play. Mark and his brother, Matt, plotted an action-packed week. I can still hear Matt that first evening, “Hey, Mark, let’s figure out what we’re going to do.” This was another one of those “alarm clock” vacations, and you know what? Those are the best kind! 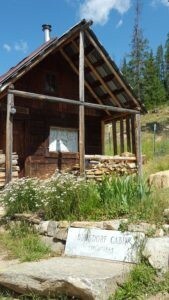 Our adventure started with an off-road ride to Burgdorf Hot Springs. The first time we’d been to Burgdorf was our very first trip to McCall in the winter when you can only get to the springs via snowmobile. I was excited to see what the place looked like in the summer. A small town was built around the springs that dates back to 1865. I can’t imagine how rough traveling here was; people certainly needed the warmth of the hot springs after that ride, I’m sure. 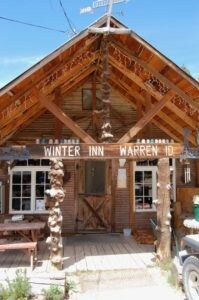 After playing in the springs and walking around the remnants of the small town we continued to the little town of Warren. 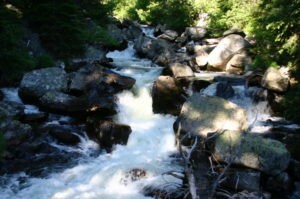 It’s only accessible by roads in the summer, the rest of the time is by plane or snowmobile. When I say small, I’m talking 20-30 hardy people live there full time. It was much larger during the height of the mining days. 15 of us walked in for lunch and about filled the place. The burgers were delicious, and the fries were perfectly crunchy! We left there and continued our exploring. We drove through the fire-damaged forest, crossed a few creeks and streams, and found a trailhead. Let me tell you, 15 people on a hike is not a quiet trek! Our friend Bill grew up hunting in Central Pennsylvania and told the kids all about the different sounds we heard, which were mainly elk. At one point we crossed what used to be a stream but was now just mud with a little log to walk on if you didn’t want to get your shoes dirty. The trail took us to Goose Creek Falls. We didn’t go all the way to the very top of the falls; we stopped after we crossed a bridge that crossed over the rushing water. The boulders were huge, large enough to climb on and still be dry while the water crashed on the other side of it. We started on the way back to our cars and reached that muddy stream and found a large footprint. This was clearly made after we went through. Uh oh. There was a large animal out in the woods with us. I don’t know if we all were hearing things or not, but we all heard rustling and movement above us on the mountain as we walked on the trail. It was time to get loud. So, there we were — 15 voices singing “99 Bottles of Beer on the Wall” while we walked. I guess with kids we should have been singing a kid-friendly song, but the beer song came out first! At one point, we heard the elk bellowing below us. We had a hunting carnivore above us and bellowing elk below us. Good thing this wasn’t a long hike. This ranks as one of our most retold stories. The youngest of the kids on that trip just turned 18, and the story of this hike still comes up. Our next stop was along Warren Wagon Road by the top of the lake where they rent kayaks. We had to try them and just about cleared the lady out of them. Some of us rode single and some rode double. We set out on the tranquil and crystal clear waters that empty into the lake. Bill and Deb paddled ahead of the rest of us as we oohed and aahed at what we saw. The river bends, and as we turned a corner, Deb was motioning for us to be quiet. A wolf had just swum across right in front of them! She said he silently appeared from the brush and slithered across the river before he just as quietly disappeared behind some berry bushes. He didn’t even shake like dogs do when they get out of the water. We sat there for several minutes hoping he would come back but no luck. He was long gone. 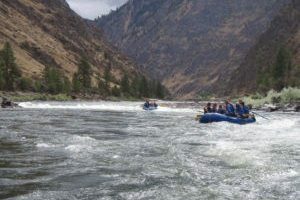 We had so much fun the summer before white water rafting that we booked another trip before we arrived at the campground. Mark’s mom and stepdad, Gail and Dave, had rafted before and didn’t have the best experience. They weren’t very excited to get back in the water. Last year’s guide was back for another summer as he was finishing college at the University of Wyoming. We put Gail and Dave in his hands. They sat on the giant box of our lunch and we called it the “Royal Raft.” We had so much fun! They do a thing called “riding the bull.” One person gets to sit on the very front of the raft while going through a rapid to see how long you can hang on. On July 4th, we went horseback riding in the hills above the lake. I like seeing an area from a high spot and this was no exception. The views of the lake and the surrounding area showed yet again why I love this place. It was also Bill and Deb’s youngest child’s 13th birthday. The camp host told us if we wanted a seat in the lakeside park for the fireworks show, we should take chairs down and lay them out. After our horseback ride, the guys took chairs down and it was time to get festive for Corinne’s birthday and the fireworks show. Bill and Deb drove their truck down to the lake while the 13 of us rode our bikes down the trail from the campground. IT turned out to be a smart move as parking was scarce. Luckily, Bill found a spot close enough to make it easy to haul our chairs to after the show. The barge was ready to go out in the middle of the lake when we got there, and we got to see several decorated boats on the docks before they headed out to watch the fireworks from the water. All 15 of us were very festive with hats, lighted necklaces, leis, noisemakers, and sparklers. We didn’t consider just how late it gets dark in McCall; we were there very early. There weren’t many people around when we played with the sparklers. At 10 p.m. it was dark enough for the show to begin. And what a show it was! It was a nice long show, far longer than the 10-minute event at Disneyland I grew up with. There were high ones, low ones, shooting ones, and loud ones. They reflected on the water, doubling the visual effects. I was videotaping, and I caught a gem. A very drunk young man was weaving his way through the crowd with a 12-pack of beer on his left shoulder. He found the place he wanted to stop, yelled out “LOVE YOU MERCA!” and promptly plopped down on a bench. My nephew and I were the only ones that clearly heard it and we started laughing at how he managed to stay vertical long enough to shout his love for our country. Needless to say, “Love You Merca” has become a mantra and gets yelled out every July 4th in that young man’s honor. (Never fear. He was fine and we saw him leave at the end of the show). I told you this was an action-packed trip, and I wasn’t kidding. 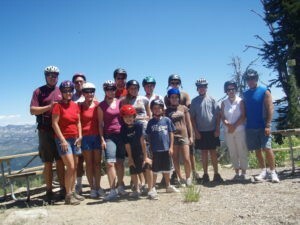 We all had bikes, so we decided to ride to Brundage Ski Resort and ride down the mountain. It was a fun ride down — not too fast or too steep. The morning of our last day was spent walking around downtown McCall and fishing. The guys and my niece found a good spot on the lake to fish for a bit. That afternoon we took our bikes to a new ski resort that had just opened up, Tamarack, just south of McCall in the town of Donnelly. Matt found out we could ride down the mountain there, too. This ride was a little steeper, and one ride down was enough for me. The dads and kids went back for a second ride down, and Bill’s son went over the handlebars, breaking his wrist. It wasn’t a bad break and I am happy to report the hospital in McCall was top-notch. They were in and out in no time with a temporary cast and enough pain meds to get home. Good thing this happened on the last day instead of the first day! Our time here was done and it was time to head home. 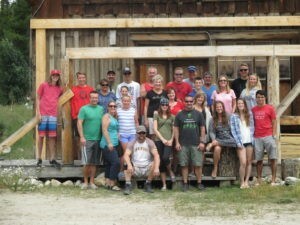 It was such a fun week with friends and family. We explored, got dirty, tried something new and made memories to last a lifetime. 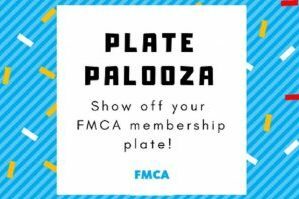 It would be several years until we did this trip again Until the next time…LOVE YOU MERCA! Oh, McCall, how I’ve missed you. 2015 was turning out to be a rough one, and I looked forward to our week-long trip like a small child looks forward to Christmas morning. Mark’s dad had not been well and passed away in May. I found a lump in my neck in February that turned out to be cancer, followed by surgery in April, and treatment in June. This July trip was a peek into the window of normal again and I yearned to see, touch, and smell all that I loved about McCall. We had a larger group this time, totaling six rigs and 24 people. We secured our favorite pod campsite for four. Two rigs were set up in the pull-through sites next to us. Our kids are grown-ups now! Our oldest son, Jeff, finished his first year of grad school at OU (Boomer Sooner!) and our younger son, Kevin, just finished his third year at NAU. Mark and I were so excited to have another family vacation with them, and we jump for joy when they want to vacation with us. It was a two-day drive for everyone. I thought a scavenger hunt for the drive would be a fun way to pass the time on the long drive. We sent out the list along with a list of rules; this group is very competitive, and I knew cutting corners (AKA cheating) needed to be dealt with at the start. We had 27 items on the list and three bonus points items. These bonus points items would be used to break any ties. I had no idea how much fun this was going to be! 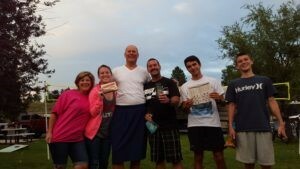 Our fabulous prize was a bag of trinkets: a t-shirt, water bottle, drink koozie, deck of cards, and candy. Throughout the planning of this trip, Mark referred to himself as Julie McCoy, the cruise director from the TV show “The Love Boat.” Of course, he had to have the correct ensemble for his role as Julie McCoy. He burst forth from the rig in full costume, navy blue skirt included, just in time for awards. Mark’s cousin Keith and his family traveled from Southern California. They are a competitive bunch and fit just right with Mark and his brothers’ endless competition. Since photo record of each found scavenger item was needed, Keith had an idea of how to get an extra “welcome to state” sign. When they got close to the California/Nevada line, he had his daughter Kelsey run to the back of their RV and take a picture of the Welcome to California sign on the other side of the road while his wife took a picture of the Welcome to Nevada sign. Kelsey didn’t quite understand the request because she took a picture of the back of the Welcome to Nevada sign. Oops. We still laugh at that. My funny moment came when we stopped in Idaho Falls for gas and I quickly ran into the store to get a bonus item from the list: a gas station receipt for something other than gas. Easy-peasy. I bought some candy and told the cashier all about our little game. And… promptly left without the receipt. Oops. We had pictures and texts flying back and forth marking off items on the list both days of our drive. It was fun to get a picture of what each other was encountering along the drive. Our friends, Ron and Terri, won the fabulous grand prize and celebrated like they won the lottery. Six rigs and 24 people. We were a big group. Three families hadn’t been to McCall before and, as the cruise directors, we wanted to make sure they fell in love with the area as if we had. Our first day was a drive to Burgdorf and Warren. We had so much fun the last time and looked forward to doing it all again. The hot springs were just as I’d remembered them, and we quickly changed into our swimsuits and got in the warm water. There was a slight sulfur smell from the springs, but we got used to it pretty quickly. There is one Jacuzzi-sized pool that is super hot. It must be the closest to the spring outlet. Nobody ventured into it during our 2007 trip, but several did this time. I could only get my feet in. It was hot! Our next stop was in Warren for lunch. The town looked the same. We parked and went into the cafe for lunch. Those of us that had been before told the others how good the burgers and fries were. A lady came out from the back and her eyes got huge. One of our group had to use the restroom and was laughing when he came out. He said he heard her on the phone talking to someone asking for help. “24. 24 people are here. I need help now. Hurry!” was what he heard her bark into the phone. A few minutes later a woman slowly came down the street riding a quad. Such is life in a small town. We cleaned them out of burgers and chicken fingers and they didn’t have any potatoes for french fries, bummer. I think the grill was tiny as the food took longer than I remembered. No worries, we were on vacation. While we waited a young couple came in for lunch. I felt bad as they each ordered a burger only to be told they were out. We must have caused quite a commotion because pretty soon the resident old-timer was on the porch chatting up the guys in our group. He told them about his family’s mining operation that was about to start up again. He even told them where it was! My brother-in-law, Matt, and our friend by the same name, Matt, both went off to find it. They got back just before the last of our group was finishing lunch. There really was a mine and we were headed there when we left. The mine was right where the old-timer said it would be. It was quite clear that this operation had stopped many years ago. Grass and bushes had grown through many of the different pieces of equipment. One of the buckets had a date stamp of 1941 on it. It was so cool to envision how modern mining was done more than 70 years ago. 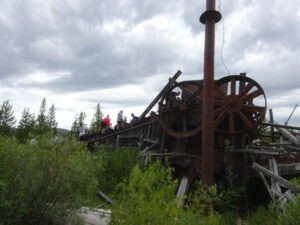 The start-up of this mine was to happen in the coming months before winter and the old timer said they were going to be featured on a PBS special. Who knows if it was true or not, but it sure was fun being out there. It felt like we’d found our own treasure. We’d made reservations ahead of time and paid most of our excursions (see what I did there with the cruise lingo?). 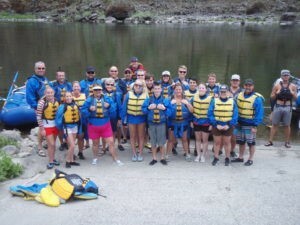 Monday was our white-water rafting adventure day. And as luck would have it, the only day of our entire trip that was cold and rainy. So cold and rainy that the company photographer was not at any of the great picture spots. At one point it was raining so hard and we were all so cold that the water in the river was the warmest thing around. Not every cruise excursion is an A+ event. We had fun no matter the conditions and I look forward to doing it all again with each of them on a bright warm and sunny day. The next day was a perfect Idaho summer day. We set out to kayak at the top of the lake just like we’d done years before. The same lady was there running the rentals. It’s nice how some things don’t change. 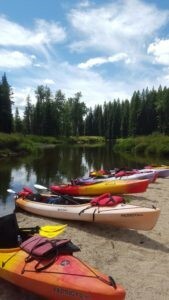 We grabbed our kayaks and paddle boards and set off up the calm waters where the Payette River dumped into the Payette Lake. I was looking for that wolf that had been spotted on our last trip. I wanted to see what I’d missed out on during the last kayak trip. Sadly, we didn’t see a wolf. We saw lots of fish, a couple deer, and a moose — a great big moose munching on berries right at the edge of the water! There we sat in complete silence for a long time watching this creature eat. You’ve never seen 24 people be so still. 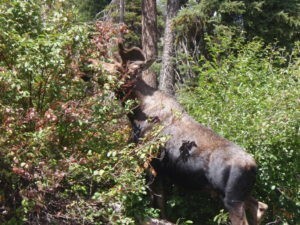 The moose was thoroughly into whatever he was eating. No “X-Games” vacation is complete without some sort of daredevil adventure. 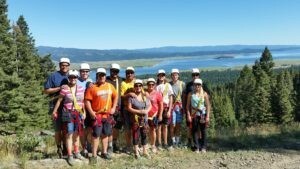 Zip-lining in Tamarack was up next. The company couldn’t accommodate all of us at once, so 12 went in the morning and 12 went after lunch. There were seven zips on our ride on various parts of the ski mountain. The views were spectacular. 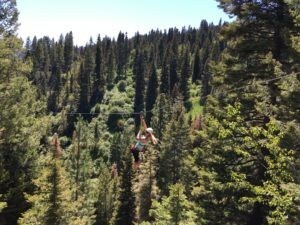 We’d zipped before in Park City, Utah, but that’s just one line that you can do over and over. 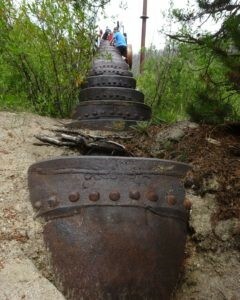 These were down ski runs, over streams, and even one zip into a tree. That one was my favorite. 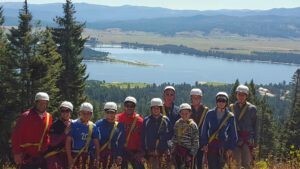 The two guides were very patient and made sure we were safely strapped into the zip every time. Keith is not a fan of heights and had never zipped before. The guides took great care of him and, minus zipping into the tree, he had fun. Matt and I certainly didn’t help the whole zipping into the tree thing. Matt and I were the first two and neither of us was phased that we were in a tree stand 40 feet up in the air. The tree swayed with the wind and we helped it sway more. We were having a grand old time. Keith, not so much. I promised Keith I wouldn’t make any other trees sway. The last zip was over a stream and between a couple trees. It was yet another fun action-packed day. The dads had an adventurous morning our last day riding down the ski runs at Brundage Ski Resort. While they did that, my friend Terri and I walked around downtown McCall. We found the original jail that is now a little museum and found a cute store to buy Christmas ornaments. We ended our week with an afternoon horseback ride with dinner with the same company we’d used in 2007. 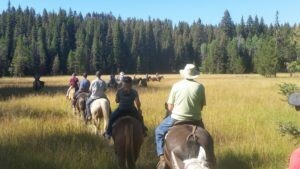 The Wranglers took us up into the forest to a large meadow. To start, those wranglers had their hands full with us. Mark’s brother, Matt, was on a horse that didn’t like to mind, which fit Matt perfectly. Matt had “Stetson” going hither and yon throughout much of the ride. I hope the Wranglers had as much fun as we did looking at the action of Matt and Stetson. We circled back to the stables where a cowboy dinner was waiting for us: ribs, corn, soft dinner rolls, and more cookies than we could eat (Believe me, I tried to make a dent in them!). It was the perfect end to this wonderful trip. It was also Ron and Terri’s 28th wedding anniversary, which called for several celebratory toasts. We ate and talked with the wranglers about our last time riding with them. Some of the horses we’d ridden in 2007 were still alive and doing well, which was good to hear. As we recounted all the fun we’d had that week, I looked around at this group. My people. This very group that I longed to spend time with while worrying about that horrible C word I’d heard in April and through my treatment. All was right in the world that week, and I can’t wait to do it all again. So many things to do in McCall. 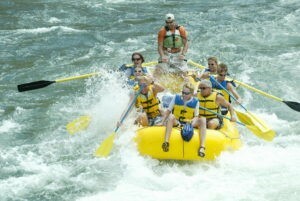 I would to try the water rafting there and, kayaking as well. Looks total fun.